Description: This nature inspired design depicts a sportsman paddling his canoe down a gentle mountain stream with the morning sky rising in the background. The curved shaped wall fixture is handcrafted with stunning Silver Mica, which is enhanced with metal hardware and decorative accents featured in a Dark Burnished Antique Copper finish. 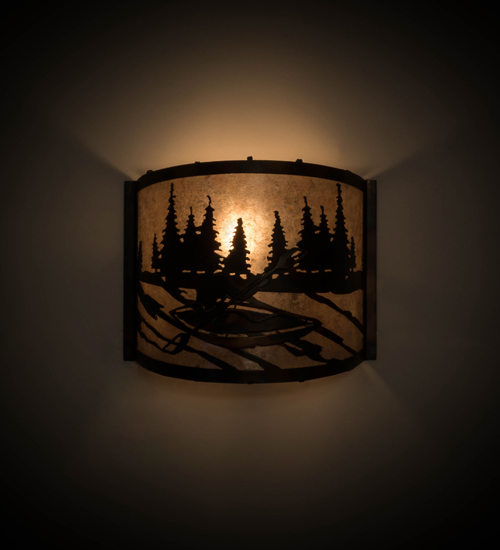 Handcrafted in the USA by highly skilled artisans at the foothills of Upstate New York's Adirondack Mountains, this wall sconce is ideal for hallways, foyers and any room where you want to make a charming rustic design statement. Custom colors, designs and sizes are available, as well as dimmable, energy efficient lighting options such as LED. The fixture is UL and cUL listed for damp and dry locations.